Irene McGee Despain, beloved mother and grandmother passed away the morning of Wednesday, Jan. 25, 2017, in St. George, Utah, at the age of 91. Irene lived a long life of dedication to her family and The Church of Jesus Christ of Latter-day Saints. 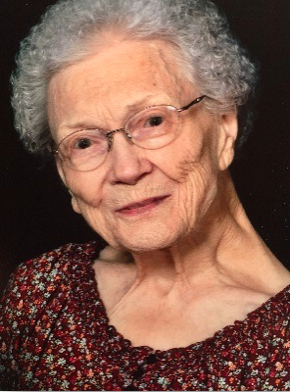 She was known as a fastidious homemaker and seamstress, a loyal friend with a subtle yet sharp sense of humor, and a dedicated and faithful member of her church, serving in countless callings. Irene was born in St. George, Utah, on Feb. 20, 1925, to Ross and Elsie Gifford McGee. When she was three years old her family moved to Draper, and at the age of 13, moved to Granite, Utah. It was while living in Granite that she met Ward, the love of her life, at the old LDS church. Their life together was a classic love story. Legend has it Ward arrived a little late to sacrament meeting that fateful day, saw Irene’s beautiful red hair shining in the sunlight near the front of the chapel, and declared that she was the girl he was going to marry someday, without having yet seen her face. Ward and Irene were married toward the end of her senior year in high school and were inseparable from that day forward, only spending time apart when Ward served in World War II. As Ward struggled with Alzheimer’s during the last years of his life, Irene stayed dedicatedly by his side, caring for him even as she struggled with her own health. During nearly 70 years of marriage together, Irene and Ward shared many wonderful adventures, most of which were centered diligently on their church service. They were tour guides for large groups in the Middle East and Europe, as well as a LDS church history tour through the Eastern United States. They moved several times for educational and career pursuits while raising their young family and finally settled in St. George which they would call home for almost 50 years. They left their home for Hilo, Hawaii, from 1983 to 1987 for four wonderful years of service until Ward retired from the LDS church education system. When they returned to St. George, they continued their church service for another 15 years as temple workers, a period of time that they cherished and made many new friends. Irene is survived by her daughter, Mary Ann (Terry) Blackburn and her two sons: Steven (Evelyn) and David (Shelly); 16 grandchildren, 25 great-grandchildren, and three great-great-grandchildren. Funeral services will be held Saturday, Jan. 28, at 2 p.m. at the Metcalf Mortuary Chapel,288 W. St George Blvd., St George, Utah. A visitation will be held Saturday, prior to services, from 1-1:45 p.m.
Interment will be at the St. George City Cemetery.